This speaker first came to my attention at Primedia's 2005 Home Entertainment Show in New York City. After a long day of bouncing between rooms and filling up a bag with superfluous literature, I was pulled from my station by a fellow Society (CAS) member to go and hear these Hong Kong-made speakers, the JAS Oriors. As is often said, it can be quite a challenge for manufacturers and dealers to get good sound in the standard-sized hotel rooms at these shows. Admittedly, I was ensconced in one of the larger conference rooms, occupied by Damoka LLC with his vintage Vitavox horn speakers, and was not that impressed with what I was hearing in many other rooms. 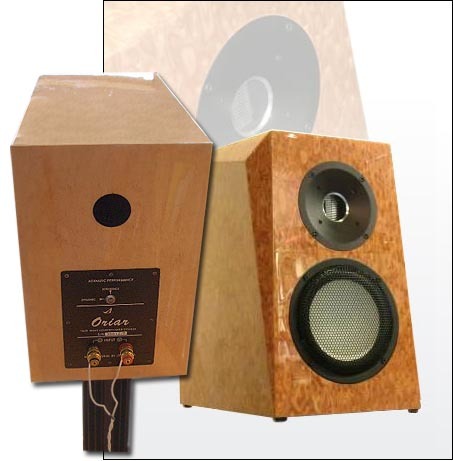 However, walking into the room with the JAS Orior speakers, I remember being pleased with the clarity and openness of the sound. 40 watts per channel. It was surprising to see a modern commercial amp employing the 805 tube since I am only aware of the vintage McIntosh MI-200 amps ever using them. (Of course, someone will now email me about an obscure 805 amp being made somewhere). Mr. Lew informs me that besides this 120-pound behemoth, he is trying to convince JAS to split this amp into monoblocks to allow for easier shipping (and even better sound). With prodding by other CAS members in the room, I asked Mr. Lew for his card, thinking to ask Srajan about reviewing them. Shortly after returning, Mr. Lew solicited 6moons for a review and I volunteered for the assignment. As regular readers will note, I have made it a point to comment on packaging quality in my reviews. The packaging of the Orior speakers is exemplary, with a molded foam encasement that completely protects the speakers within the box. I don't foresee shipping damage problems with these speakers for dealers or second-hand buyers. My eyes lit up when I saw the beautiful polyester piano-quality clear coat over the birdseye maple veneer finish. The cabinets are made of high-quality MDF. I've become increasingly impressed with the efforts by the Chinese manufacturers to achieve first class fit-and-finish for the export market. (My first positive experience in this regard was seeing the Usher speakers at CES several years ago.) Where the front edges of the speaker baffles are beveled in order to minimize diffraction, the seams are perfect. In short, the finish was flawless. The pair of binding posts on the back were robust and reminded me of the excellent WBT posts. JAS has made an interesting selection of drivers for the Orior speakers, employing an 11 centimeter, dual-ribbon aluminum tweeter and a 17.8 centimeter ceramic cone bass driver. It has been my experience that mating a ribbon tweeter to a cone bass driver requires a great deal of care since the speed and clarity of the ribbon tweeter is difficult to match with a conventional cone woofer. JAS' selection of a stiff, ceramic cone woofer would seem to indicate that they were aware of this issue. Completing the design is a rear bass port. An eight-page owner's manual is included, which gives good basic information on the care and setup of the speakers. Listed specs on the speaker are: 88dB sensitivity, 8-ohm nominal impedance, 10 - 200w power handling, 2200Hz crossover frequency, and a claimed frequency response of 29Hz - 60 kHz. Grill cloths are mentioned but none were provided. I never use them anyway unless it is recommended by the manufacturer. An unusual feature of the Orior is a key. This key inserts into the back of the speaker and, by rotating it ninety degrees, allows the listener to select between two different crossover settings: Dynamic or Reference. This feature is not addressed in the owner's manual but Mr. Lew informed me that I have the only pair of Orior speakers in the United States and the manual will be updated soon. He went on to say that the dynamic setting somewhat favors the midrange while the reference setting gives a more standard presentation. Mr. Lew advised me that the speakers "need between 200 - 400 hours of use to get close to their desired response". He sent me a pair with 100 hours on them so I spent the first two weeks playing them during all waking hours powered by a Panasonic SA-XR45 digital receiver, on loan from a friend. The other item I borrowed was a pair of robust, early 1990's Acoustic Energy stands that were made for their popular AE1 speakers. These are 28-inch stands, which put the speakers at a good listening height for both my upstairs and downstairs systems. I was concerned about getting the height right so as not to create any vertical dispersion problems for the ribbon tweeter but Mr. Lew assured me that they are quite forgiving in this respect. Four blobs of Blu-Tac served to affix each speaker to its stand. I like the idea of breaking-in speakers with a digital amp since it runs so efficiently and conserves electricity. What I didn't expect was how good this receiver would sound and how it seemed to mate well with the speakers. The earlier model SA-XR10 was a budget fave among many, including a number of CAS members. The XR10 is a 5.1 receiver with an 80wpc rating while the XR45 is a 6.1 receiver with 100 watts. I presume that the sound of these receivers is much along the lines of Jeff Day's experience with the Sonic Impact T-amp. What I did notice about the Panasonic amp, in using it with my JBL Century L-100s, is that it seems to roll off the high frequencies somewhat while also lacking some bass. This same sonic signature was present on the Oriors, but at this point, I did not know how much more bass would develop in the speakers as they broke in. Rather than avoiding listening during break-in, I found myself marveling at the wonderful vocal presence and lightning-fast treble. Mel Torme's voice on the cut "Too Close for Comfort" on a 1985 Polygram jazz compilation [819 344-2] was sumptuous and totally without glare. In fact, it was the best I've ever heard it sound. In the middle of the second week of break-in, I decided to hook up my Fisher 500C receiver (the subject of one of my prior reviews). Right away, there was more bass and punch but the overall sonic picture became less refined. I played the Fisher for the day and then reinserted the Panasonic receiver for the remainder of the week. At the end of the second week, I moved the speakers downstairs into my main system to begin critical listening. While playing the speakers upstairs, I had come to prefer the dynamic setting of the crossover so I left it in that position. I also disconnected the Audio Physic subwoofer and ran the speakers off my Red Rose Model 2A Silver Signature amp in ultralinear mode. One of my favorite 1990's jazz records is Joe Sample's Ashes to Ashes. Mastered by Doug Sax at the Power Station, it is one of my best-sounding modern vinyl recordings, particularly of jazz piano. The JAS owner's manual advises that the "drive unit suspensions will loosen up during the first hour of use." This was exhibited by a brittle quality to the sound, with the full weight of the piano not fully realized. By the time I played the second side, things were sounding better. I began to get the measure of the speakers right away and this initial impression remained throughout my time with the Oriors. What you will immediately notice is the lightning-fast response of the tweeter, a characteristic of ribbons that make them popular with many designers and listeners. However, as I mentioned before, mating a ribbon tweeter to a cone woofer is a tough assignment. JAS has done a better job than many but I still can hear a greater clarity in the highs than in the mids and bass. I am particularly sensitive to such thingies others may not be bothered by this. For example, a number of audiophiles I know find the ribbon tweeter on Magnepan speakers to stand out from the rest of the speaker in this same way. Others I've talked to do not hear this. I am not saying this speaker is bright or has an aggressive tweeter like the FAB Audio Model 1s I recently reviewed. What I am saying is that the tweeter can stand out at times at a greater amplitude rather than be bothersome in a qualitative way. If the speakers belonged to me, I might find myself padding down the tweeter a few dB. To give you some perspective on my listening taste, I put in a padding resistor on the tweeter of my ProAc Tablette 50 Signatures years ago. If a speaker errs from neutrality, I'd prefer it do so to the darker side. Around this time, I switched the crossover setting to the reference position. At first I thought that the drivers seemed to integrate better on this setting and there was a more even performance overall. However, after switching back and forth between the settings on various pieces of music, I ultimately came to prefer the dynamic position. This may be because the midrange -- to my ears the strength of this speaker --is the more dominant aspect of the presentation in this setting. Getting back to the tweeter, readers of my FAB Audio Model 1 review (where I complained of an aggressive tweeter) and now this review, may be thinking "Oh boy, Marsh has two bright listening rooms". Not so, my gentle (ahem) readers. While I know this to be untrue based on my own experience with many speakers in my two listening areas, my readers might like some more evidence. So to go the extra mile, I dragged the Oriors over to my friend Bob's house. Bob lives right in my neighborhood and I helped him put his system together. It consists of a fully-restored Scott 222C integrated tube amp (widely regarded as one of the best-sounding vintage integrated tube amps), a Vecteur D-2.2 transport, Benchmark DAC-1 and vintage Mordaunt Short Pageant speakers. It's a very musical system with a warm and relaxed presentation. Neil Young After the Gold Rush, Reprise - "Southern Man"
John Coltrane Coltrane Plays the Blues, Atlantic Jazz 1382-2 - "Blues to Elvin, Blues to Bechet"
Lucinda Williams World Without Tears, Lost Highway label - "Fruits of My Labor"
Krishna Das Breath of the Heart, Karuna label - "Ma Durga"
The Oriors did an excellent job on vocals and there was clearly a significant jump in bass performance, soundstaging and detail over the vintage Mordaunt Shorts. This was hardly surprising. Bass extension on the Oriors is very good. 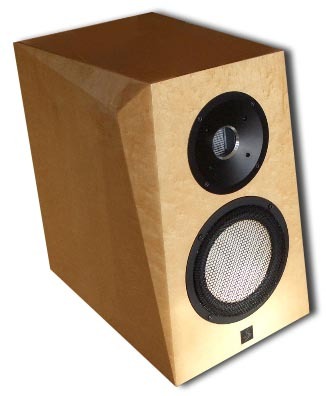 As Srajan has editorially noted, one naturally tends to be pleasantly surprised by good bass extension from a two-way monitor speaker while the same amount of bass from a floorstander is viewed as less of a marvel. This thinking applies here, however I am skeptical of JAS claim of 29Hz performance. I would say the bass is solid down to around 40 or 45Hz. 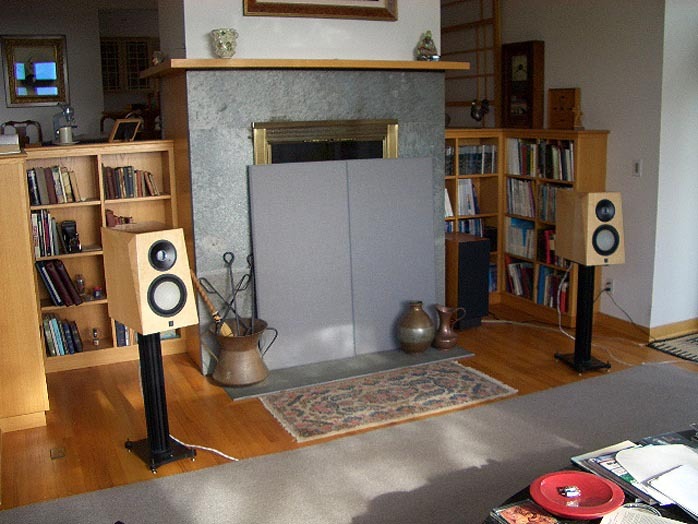 The point of the bringing the speakers to Bob's house was to provide a third acoustic environment for the speakers and further dismiss the room acoustics interaction question. The treble level was about the same as I was hearing at my house. This additional treble energy was not a problem on the smoother recordings, particularly the Krishna Das, much of which may be suitable for Yoga class background music (Bob is a Yoga teacher). Likewise, the Coltrane recording fared rather well. Coltrane's sax came across with very good body and emotional nuance. However, on more raw-sounding recordings like the Neil Young and Lucinda Williams, the balance was not ideal. Returning the speakers to my downstairs system, I placed the Acoustic Energy stand spikes into my recently purchased Starsound Technologies coupling discs. These beautifully made brass discs have a pointed depression in the center, which is designed to accept the point from their product mate, the Audio Points (which I'm holding off on purchasing for now). It will also accept standard speaker stand spikes but Starsound advises that their products couple optimally. While my initial goal was protection of my hardwood floors, I must report that the discs have audibly improved the soundstage focus and transient performance with my Audio Physic Step SLE speakers. Leroy Vinnegar's Leroy Walks Again [OJC-454] was first on the platter. On the second cut "Down Under", drummer Milt Turner was portrayed very well except for the cymbals, which were just too prominent. I should mention that I did try positioning the speakers more off-axis from my listening seat and this helped somewhat but not enough. Once more, I switched back and forth again between Reference and Dynamic and noted further that the trumpet took on more body and weight in the dynamic setting. For my final album selection, I played the excellent recording by Mose Allison, Ever Since the World Ended [Blue Note BLJ 48015'. Mose's voice, with every inflection of his quirky lyrics, was clearly presented. On the cut, "Top Forty", the extended sax solo became a little reedy as it ascended the scale into the tweeter's domain. As a point of reference, I always like to go back to my reference speakers, the Audio Physic Step SLEs with the Audio Physics Luna subwoofer. Playing the same records, I found the Steps to offer a clearer window into the soundstage, more bass and midrange information and a softer treble. In fairness, I must state that some find the Steps to be somewhat dark in the upper treble, where the sense of airiness is conveyed. Here is where the reader should take my listening bias (preferring dark if erring from neutral) into account. The area in which I would give the nod to the Oriors was in the upper midrange, where the Oriors were smooth and never ruffled. The Steps can be forward in the upper mids at times but this is manageable with proper equipment matching.